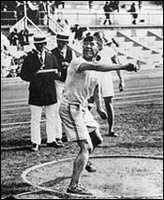 94 years ago today, Jim Thorpe won the Olympic decathlon. With 8,412 points, he breaks the world record by an incredible 998 points. This came eight days after winning the pentathlon. His closes competition was Hugo Wieslander of Sweden, who scored 7724 points. When Thorpe is introduced at the awards ceremony there is a great burst of cheers, led by King Gustav V. Besides the gold medals, Thorpe receives a jewel-encrusted chalice in the form of a Viking ship (a gift from Czar Nicholas of Russia) for winning the decathlon and a life-size bronze bust of the Swedish king for capturing the pentathlon. In congratulating Thorpe, Gustav tells him, "Sir, you are the greatest athlete in the world." Thorpe reputedly replies, "Thanks, king." He was later stripped by the International Olympic Committee of his gold medals for professionalism. They were eventually restored to his family in 1983, thirty years after his death. In this writerÂs humble opinion, Jim Thorpe was the greatest athlete of all time. No other athlete in history can come close to these and his other achievements. On one my numerous trips around the county to various sporting events, I had the opportunity many years ago to see his gold medals in the state capital in Oklahoma City. They were displayed in a case in the capital rotunda along with the classic painting of Thorpe in this 1912 Olympic uniform. This was a major event in my life, as I grew up hearing about Thorpe from my father. I was fortunate to have my wife and young daughter with me. The man is still inspiring athletes son many years after his great accomplishments and eventual death. Say what you want about Michael Jordan, Joe Montana, Carl Lewis and all the rest. Yes, they are indeed great athletes, but none of them compare to Jim Thorpe. He is indeed the GREATEST ATHLETE OF ALL TIME. We should all take the time to think about this great athlete on the anniversary of his greatest Olympic achievement. In a copywrited article from the Houston Chronicle, USA Soccer men’s head coach Bruce Arena’s contact will not be renewed by the U.S. Soccer Federation at the end of the year. 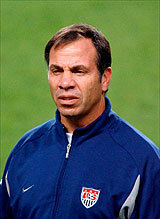 Arena, who has been the most successful coach in USA Soccer history, began the job in 1998, coached the men’s team to 71 victories and a quarterfinal appearance at the 2002 World Cup. Now, three weeks after the Americans' disappointing first-round exit from the World Cup in Germany, Arena is out despite an apparent wish to return to the team. Everyone knows the drill. If the team wins, it is the players. If the team loses, it is the coach. I watched all the USA games in this year’s World Cup and it was obvious to me it wasn’t Arena’s fault they lost. These guys played like they were out there for themselves and couldn’t have cared less about team goals. I am sure they wanted to win, but they didn’t have the fire and enthusiasm of past teams. It was eleven guys playing as eleven, instead of eleven guys playing as one. Don’t be surprised if we don’t see Team USA any better in four years. In fact, we could possibly be worse off. (OKLAHOMA CITY, OK) USA Softball sent a message in its opener at the World Cup of Softball presented by Kellogg’s Frosted Flakes with an impressive 14-0 shutout victory over Great Britain. After suffering a 2-1 loss to Canada in its opener at the 2005 World Cup, the U.S. was determined to not have it happen again. The team totaled16 hits in just five innings as the game was shortened to five innings due to the international run rule. Team USA put up two runs in the first inning off a two-run homerun by Jessica Mendoza (Camarillo, Calif.) that scored Caitlin Lowe (Tustin, Calif.). The Great Britain defense kept the United States off the board in the second, allowing three hits but stranding three on base. Monica Abbott (Salinas, Calif.) started in the circle going three innings, allowing no hits and striking out six batters. The bats of the red, white and blue came out strong in the third inning with the US posting five hits for six runs, hitting through the entire lineup. Natasha Watley (Irvine, Calif.) hit her first triple of the year scoring Laura Berg (Santa Fe Springs, Calif.) who singled to right field. With two outs, Mendoza again launched a ball over the fence, her third of the season, for two RBI. This is the first time in her career with the National team that she hit two homeruns in a game. Alicia Hollowell (Suisun, Calif.) came in to pitch the fourth inning, striking out one batter. The team again scored six runs in the fourth off five hits. With two runners on Andrea Duran (Selma, Calif.), in her first International appearance with Team USA, soared a homerun ball over left field for a three-run homerun. Mendoza singled again for an RBI, finishing the game 3-4 with five RBI and two runs. Jennie Finch (La Mirada, Calif.) wrapped up the game for the U.S. throwing the fifth inning with three strikeouts to close out the game in five due to the run rule ahead. Team USA will take on Canada tomorrow at 6:30 p.m. (CT) to open up session II. The Houston Astros fired hitting coach Gary Gaetti on Wednesday and named Sean Berry interim hitting coach. The Astros entered this season with three regulars, Brad Ausmus, Adam Everett and Willy Taveras, among the bottom of hitters in Major League Baseball at their positions. It's hard to see what Gaetti could have done these cases. Maybe he deserves some blame for Jason Lane's decline, but if that's the case, he definitely deserves credit for how Chris Burke and Mike Lamb have progressed this season. More than anything else, it might have been Morgan Ensberg's injury problems that cost him his job. Berry had his one big year in the majors as an Astro in 1996. The 40-year-old was in his second year in the role of minor league hitting coordinator for the club. 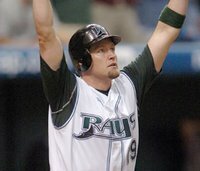 The Astros, in an attempt to boost their record for the second half of the season, acquired outfielder Aubrey Huff from the Tampa Bay Devil Rays. Huff, who played his high school ball at Vernon (Ft. Worth) High School and college ball at Vernon College in north Texas and the University of Miami is excited about coming home to play in Texas. "I'll tell you," Huff said, "I'm very, very excited about Houston. There was a rumor last year about Houston, and I was excited to hear the rumor about it." Trade rumors had been swirling around Huff for the past couple of seasons. Several clubs reportedly showed interest in him over the last few weeks as well, including the Tigers. “It's like I've been dangling in front of teams the last three years," he said. The question is where manager Phil Garner will decide to play him. "I don't really know what the situation is with who they've got playing well and what have you," said Huff. "I've been playing third base here in Tampa, and this is the first year I've felt really comfortable playing third. I played right field, too, and I really enjoyed playing there." First base is also an option. "Whatever it takes to get the best possible lineup on the field is what I'll do," Huff said. With the Astros clearing looking for anything that will raise them to the level that carried them to the World Series last season, Huff’s addition may be the added punch they need. In a copyrighted article from the New York Daily News, Major League Baseball has indicated that San Francisco Giants baseball player Barry Bonds will face indictment for perjury and tax evasion. As I have stated in earlier posts, Bonds indeed will called to task for his actions (or lack of action). Keep alert for further news on this story. TexSport Publications will be here to update the facts and give our own unique perspective on the issue. 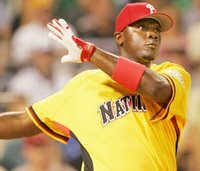 Philadelphia Philles’ Ryan Howard wins the Century 21 Home Run Derby at PNC Park in Pittsburgh. He hit 23 home runs, defeating David Wright of the New York Mets by one run. The Houston Astros’ Lane Berkman hit three home runs in the first round, but was eliminated. At least it was good to see an Astro in the Derby. On a personal note: Being born in Pittsburgh and growing up a diehard Pirate fan, it is good to see the All Star Game in Pittsburgh. I remember going to Three Rivers Stadium and seeing the Pirates play. I never got to go to Forbes Field, but I do remember seeing it on TV. In fact, my grandmother lived about three blocks from Three Rivers Stadium, in the same block as the Rooney family (of Steelers’ fame). PNC Park looks great for the All Star Game, but I cannot be sad thinking about the parks of old. Oh well, progress marches on. The final results of the Home Run Derby are listed below.